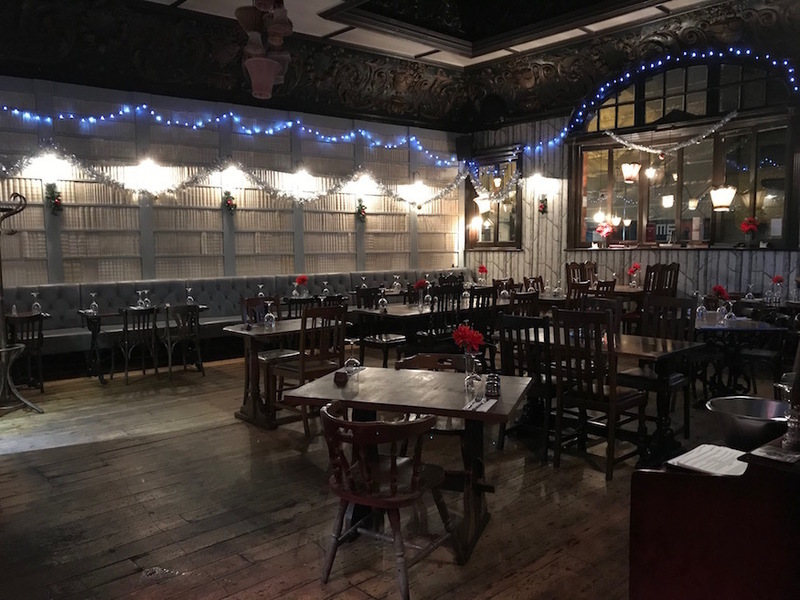 This pub has been voted by our readers as one of the best in Kilburn. See the full list of winners here. What no beer? This pub refuses — reluctantly — to sell draught beers, in protest at the sales strategy of its big pubco owner. 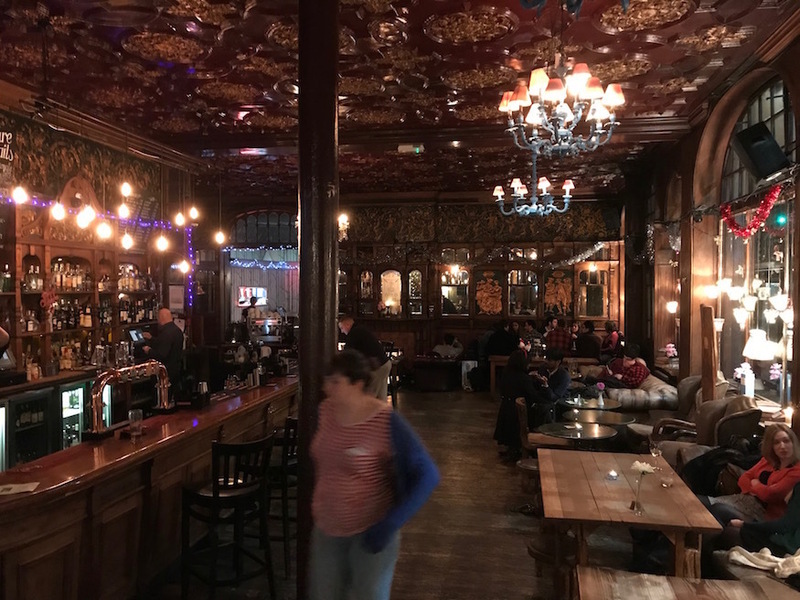 It's still a glorious venue, however, and we had much pleasure sipping a red wine while helping one of the teams taking part in the Tuesday night pub quiz. A build-up of plaque on the walls. If you simply have to drink beer, the Lion stocks a few bottles, including Old Peculiar. Meanwhile, there's enough lager, wine and spirit choice to keep you merry while you take in your surroundings. 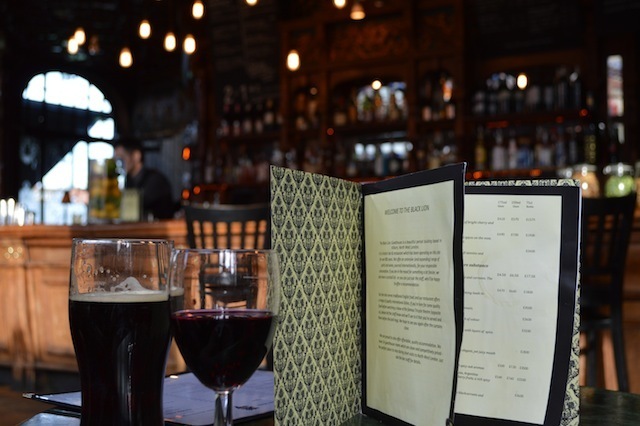 We even clocked a short cocktail list — most unexpected in these high-Victorian surroundings. As was the soundtrack of Coldplay's most hummable ballads. 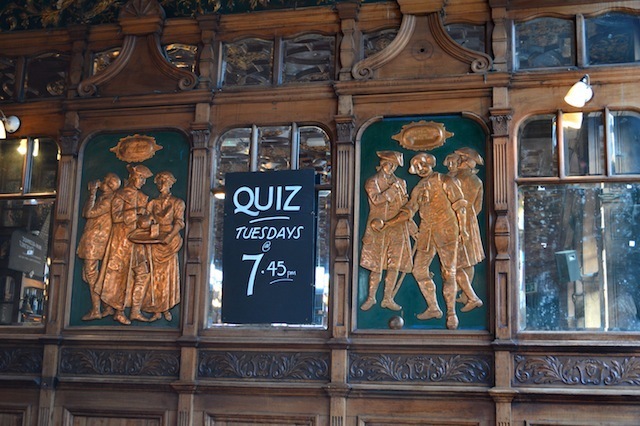 The Black Lion is blessed with one of the most sumptuous interiors of any pub in London. 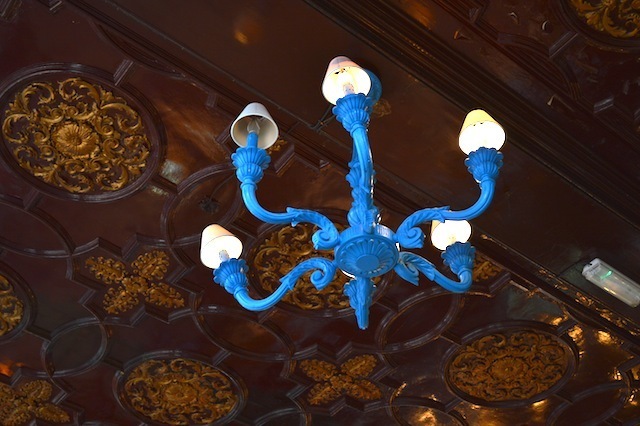 The ceiling, walls and bar are magnificently furnished with brass panels, gilding — and any number of other decorative techniques we're not equipped to describe — that even our camera had a hard time taking it all in. 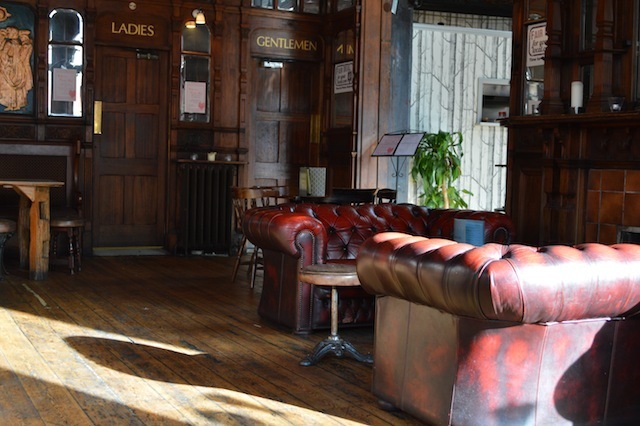 Add some leather armchairs and couches, a real fire, and a scattering of bookshelves, and you have a very pleasant environment to discuss the pros and cons of beer companies. A side dining room is decorated in a very different style — anaemic panelling and fake book cases — but still impresses. 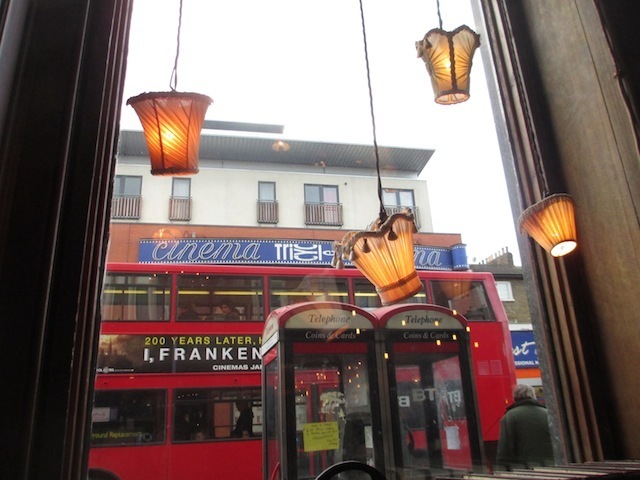 We haven't yet tried the food, but it looked very inviting, and at prices lower than the North London Tavern down the road. If you simply can't get enough of the place, the Lion maintains 14 guest bedrooms upstairs. See, see, you can get beer here, if you're prepared to go for a bottle. 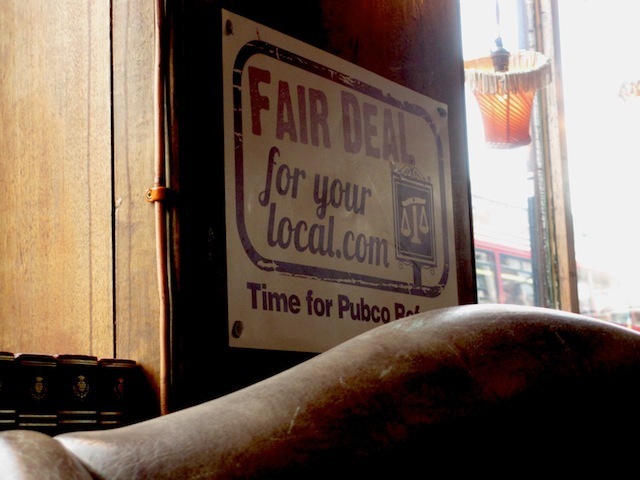 The pub's dispute with its big pubco owner is readily apparent.